Cook and drain linguine as directed on package; cover to keep warm. Heat water in 12-inch nonstick skillet over medium-high heat. Add bell pepper and frozen vegetables; cook 2 to 3 minutes, stirring frequently. 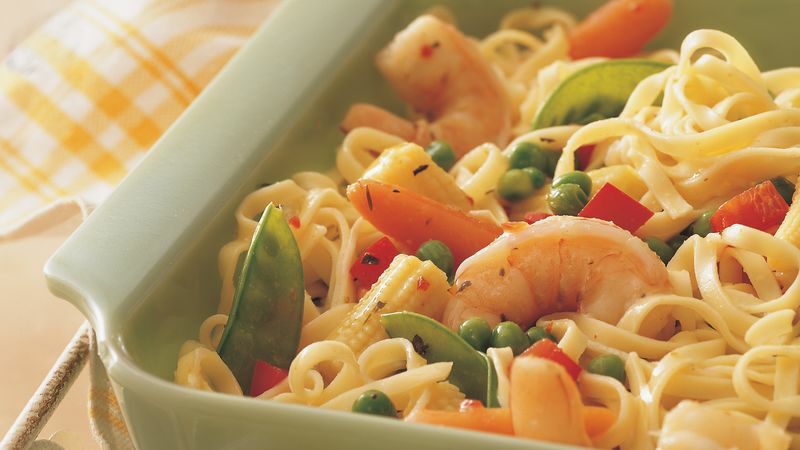 Stir in shrimp. Cook, stirring frequently, until vegetables are crisp-tender and shrimp are pink. Stir in marinade and honey. Cook, stirring frequently, until thoroughly heated. Serve over linguine. Uncooked shrimp can usually be purchased at the seafood counter of large grocery stores. Or if you like, purchase frozen shrimp so it's on hand when you need it. Just follow the directions on the package and thaw before using.